Aside from movies like Oliver Stone’s Wall Street and Martin Scorsese’s more recent Wolf of Wall Street, one of the few experiences the average layperson will have had with investment fraud is Bernie Madoff, infamous for a Ponzi scheme that defrauded nearly 5,000 victims of over $64 billion in 2008. Nearly a decade later, Madoff’s sons’ estates have agreed to repay $23 million to victims on the basis that the profits the sons earned were obtained through their father’s illicit dealings. However, victims and their lawyers say that justice is too slow in coming as the feds still struggle to untangle and repay funds. Both Mark and Andrew Madoff have died in the intervening years, from suicide and cancer respectively, so this battle largely came down to lawyers for their individual estates working to come to find common ground with lawyers for the trustee of the original principal, Irving Picard. This new agreement does not supersede the Justice Department’s Madoff Victim Fund, which has so far paid nearly $40 million to the fund’s administrator, and nothing to victims. The argument that this accord resolves is that, due to Mark and Andrew’s employment at the Madoff family investing firm and the lavish lifestyles they led during the time the fraud was being perpetrated, even if they were not directly at fault for fraud, by profiting from it, their gains were ill-gotten. Neither son was ever charged, or even accused of criminal participation in the Ponzi scheme. Bernie Madoff remains in prison under a 150-year charge. In 2009, his brother Peter Madoff received a 10-year prison sentence for his involvement. Bernie Madoff’s wife Ruth has been named in several civil suits by victims, in response to her extravagant spending, but has also never been charged with or accused of any crime. It appears that the three phase project of determining who was involved, both as victims and criminals, tracking the flow of funds in and out of the Madoff Ponzi scheme, and assessing who should receive repayment and in what amount will be a process that lasts decades for the Justice Department. In the meantime, many of the elderly investors, or those who were particularly hard hit by the fraud and losses, are seeing issues of mortality and life pass them by, waiting for the slow wheels of justice to finally provide closure. 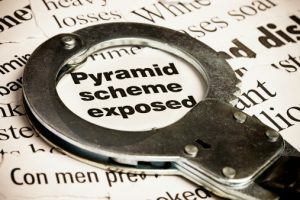 The reality of a Ponzi scheme is that it can be hard to spot for an amateur investor, but any time profits are promised, and recruitment is the principal form of generating funds, skepticism should be the watchword. The Frankowski Firm’s experienced securities fraud attorneys have spent years successfully representing investors who have lost money as the result of investment fraud. If you or someone you know has lost money as a result of such a scheme, please contact The Frankowski Firm at 888-741-7503 to discuss your potential legal remedies or complete the contact form.